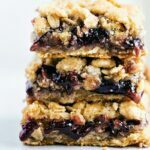 Incredibly simple and delicious oatmeal cookie jam bars. These bars come together in less than 30 minutes and only require 6 ingredients! 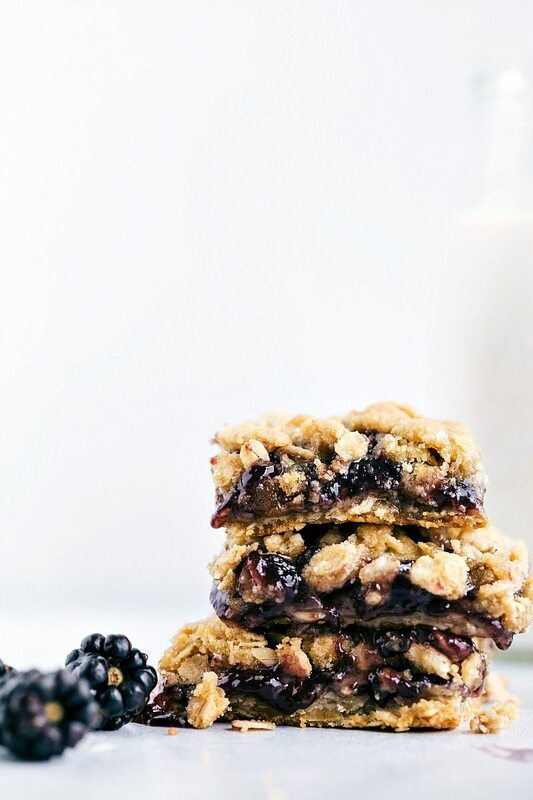 Today, I’ve got some super simple and delicious blackberry oatmeal cookie jam bars. These bars are so simple and take just minutes to make. They are the perfect last-minute dessert to bring to a brunch or surprise your Mom. And they can all be mixed up in one bowl. I love when that happens! Minimal dirty dishes and super quick clean-up. Basically the base is just a butter, sugar, and flour mix. A little over half of that base gets pressed into the bottom of a pan. Then jam gets spread on top. For the jam you can use whatever flavor you would like! If you don’t have a blackberry jam or don’t like blackberries, feel free to use whatever flavor you do like. I’ve done these bars with raspberry and strawberry and loved those flavors too. Whatever you prefer. One thing to make sure you do is line the pan with parchment paper. When these bake the jam will seep out along the edges and if you haven’t lined your pan it makes for an interesting challenge trying to remove these. I speak from experience on this one 🙂 Not too many other directions are needed – these live up to the first word in the title – simple! Line an 9 x 9-inch pan with parchment paper and set aside. Press a little over half of the mixture into the bottom of the pan. Spread the jam on top of the base avoiding the perimeter of the pan otherwise it will leak out and burn on the sides. Sprinkle the remaining oat mixture on top of the jam. Bake for 30-35 minutes or until the top is lightly golden. Remove and allow to cool at room temperature for at least 2 hours before cutting into the bars. Bars best enjoyed within 2-3 days. Sounds pretty easy and very delicious! 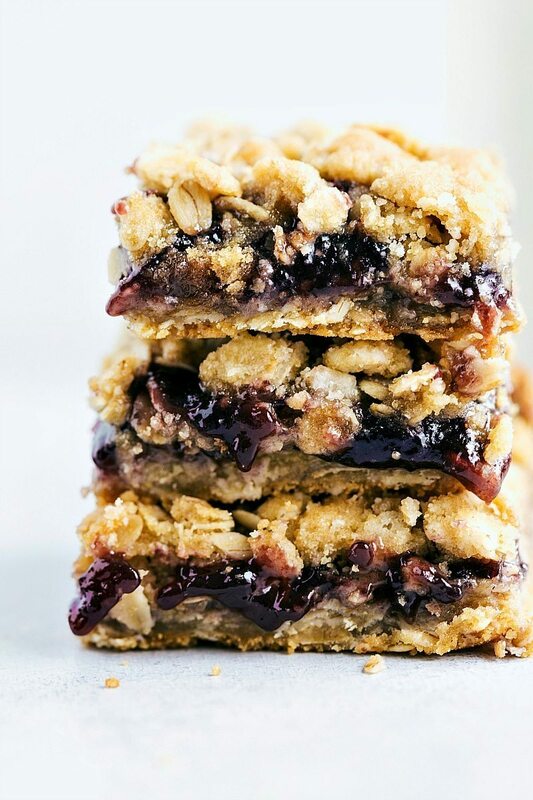 Who needs any savory brunch recipes when there are these amazing jam bars available???? LOVE these!!!! These look delicious!! I love Bonne Maman jam – it is the best! Brunch week sounds like so much fun – I hope I win something!! Mmmm these jam bars look great. 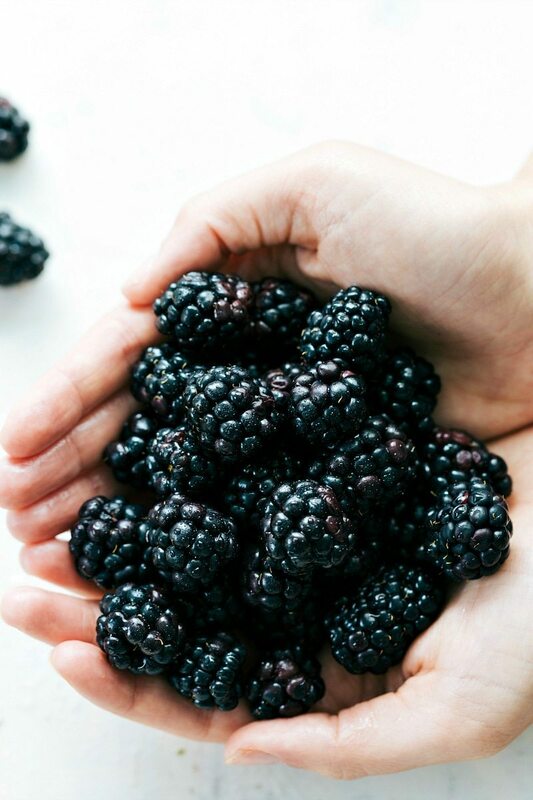 I love blackberries. These are gorgeous!! Love them, pinned! Simple and easy? Yes, please! Especially when they involved blackberry jam. I’m sure I could snack on these bars all day! That jam is screaming my name! YUM! Wow your jam bars look amazing. It is great you can swap out any jam. What could be more perfect than brunch week! These bars look so good! I love how easy they are to make and Bonne Maman is one of my favorite jams to use! Yum! I love how easy these are to whip together. I don’t think I’ll be able to resist adding some peanut butter with that jam! Pinned! I almost just licked my computer screen. Love how delicious these bars look, Chelsea! Simple and tasty…pinned! These bars – yum! Love the jam layer and oatmeal cookie base. Hooray for brunch week! oh my goodness, I love these! I got fig preserves from Bonne Maman but will definitely look for their blackberry jam!! Delicious!! My mom made something really similar when we were growing up and I absolutely loved it! Can’t wait to try this version! I just made this recipe but instead of jam I used apple butter in one batch and pumpkin butter in another…very good for fall celebrations that will be coming up shortly. 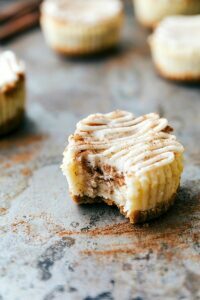 Made these using homemade cinnamon peach jam and they were absolutely wonderful! Made them with lingonberry jam from IKEA, which is pretty tart, but there was actually a good balance between that sharpness and the other flavors. They are delicious! Ooo that sounds delicious! 🙂 Thanks for the comment! These are amazing. But I would not put a whole cup of jam in it. The first time I did and they did not hold their shape. Just remade them with half a cup, and they are perfect!